alaTest has collected and analyzed 369 reviews of Apple MacBook Pro Retina 13-inch (Late 2016). The average rating for this product is 4.5/5, compared to an average rating of 4.1/5 for other products in the same category for all reviews. People are impressed by the screen and design. The usability and portability are also mentioned favorably, whereas many are less positive about the connectivity and price. We analyzed user and expert ratings, product age and more factors. 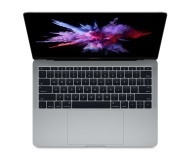 Compared to other products in the same category the Apple MacBook Pro Retina 13-inch (Late 2016) is awarded an overall alaScore™ of 93/100 = Excellent quality. The 2016 MacBook Pro lineup represents Apple's biggest laptop shake-up in years, taking what was already a a premium brand and pushing it up a notch. The MacBook Pro line has long represented the pinnacle of stylish and sturdy laptop design, and the overhauled 2016 edition is a huge refinement on Apple's already great formula. Does the Touch Bar elevate the excellent 13in MacBook Pro to portable computer perfection? The entry-level MacBook Pro delivers a flagship laptop design from Apple that many will be happy with, without getting caught up in the new Touch Bar and Touch ID option. Apple has revamped its MacBook Pro range delivering a device that is thinner, lighter and more powerful, and we were at the Apple Event at the company's headquarters to check it out ahead of it going on sale in November. The inventive Touch Bar streamlines work and saves clicks, and Apple has improved almost every part of the thinner, lighter MacBook Pro, including a larger touchpad, faster components and a flatter keyboard. iPhone's Touch ID is handy on the Mac, too. Apple's smart, useful Touch Bar makes it well worth splurging on the step-up version of the streamlined 13-inch MacBook Pro. A massive touchpad dominates this incredibly skinny, high-powered laptop. The screen really pops, with less bezel and wider color range. Adding space grey as a color option gives it a bold, mod look. This version leaves out the amazing new Touch Bar. It's more expensive than the model it replaces and has only a pair of USB-C ports plus a headphone jack for wired connectivity. The shallow keyboard takes getting used to. While it's missing the buzzworthy Touch Bar, the entry-level MacBook Pro is effectively the redesigned and updated 'Retina MacBook Air' that you've been waiting for.